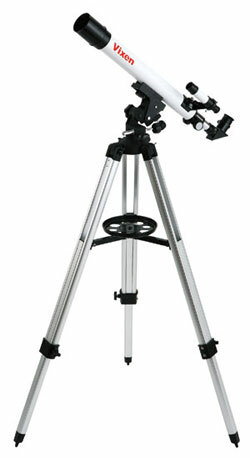 This is the perfect starter scope package for beginner astronomers. Supplied with two Plössl eyepieces (10mm and 20mm) and 90° star diagonal, the scope will deliver excellent views of the planets and moon. A 5x20mm finderscope makes targeting quick and simple. The 90° star diagonal supplied with the package allows this telescope to be used for terrestrial observing as well as stargazing. This makes it perfect for those that want to observe ships and boats on the coast or on lakes. The Space Eye 50M is also a very capable wildlife watching instrument with the supplied 20mm Plössl eyepiece providing a useful 30x magnification for birdwatchers. The altazimuth mount supplied includes slow motion handles to allow for smooth tracking of objects as they move across the night sky. Assembly is quick and easy with a single bolt securing the tube to the mount head. The package is light enough to be easily transported at under 3kg.